Things are looking a little different around here aren’t they? I’m delighted to announce that Chew Town has had a shiny new facelift, and not one of those in-and-out-in-a-lunchbreak facelift, I mean the whole shebang! The blog was starting to develop crows feet (read: lots of superfluous back end code) as I tried to deal with an early choice to run the blog on the blogger platform two years ago. I recently realised I had gone as far as I could, so my wonderful new friends over at Pixel Palace did two spectacular things: 1. they ported 2 years worth of content over to wordpress and kept all my links perfectly in place (it was scary for all of us); and 2. they designed and implemented this amazing shiny new website with heaps of amazing customised elements to give me everything I could have dreamed for. A massive thanks to Jen and Chris who have been absolutely amazing to work with and did it all in the blink of an eye. Apologies for not posting for a little while but I had to hold off posting while we tested the new site. I hope you all love the changes as much as I do – I’d love to hear what you think! To celebrate the new and improved Chew Town, I am continuing on with my Easy Dulce de leche recipe post to bring you another amazing sweet condiment that can be used for just about anything – Homemade Gianduja Spread (Nutella). 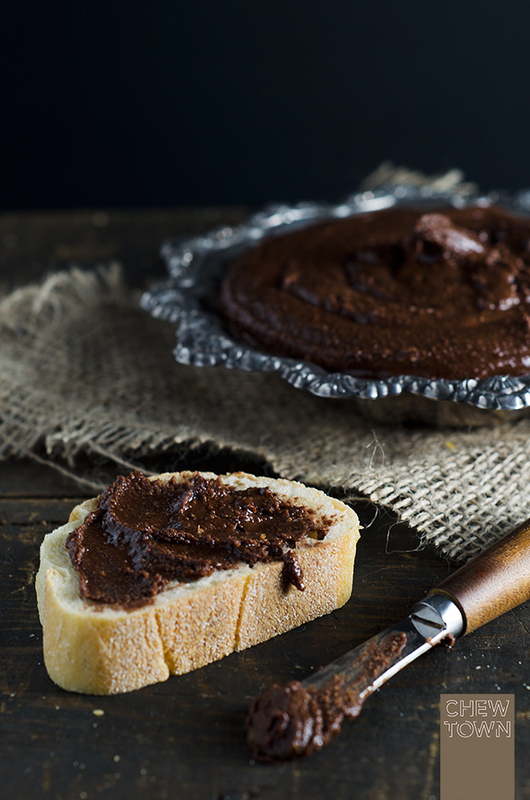 Did you know that Nutella was created by Italians? Italian’s love their chocolate, and Gianduja chocolates are made from hazelnut paste and chocolate. Making this spread is super easy and all it requires is hazelnut, chocolate, icing sugar, hazelnut oil and cream – and voila! 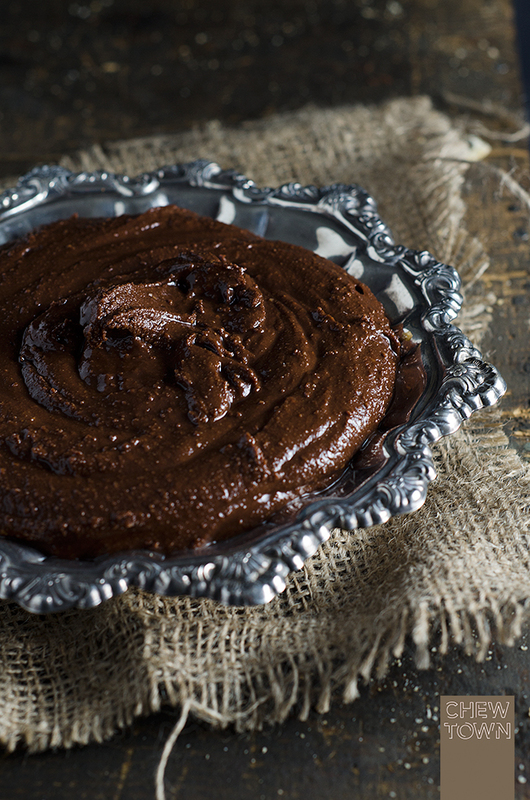 You have a pretty spectacular jar of chocolate spread. I defy you not to eat all of this in one sitting! Place hazelnuts in one layer on a lined baking sheet and bake until slightly golden (about 10-12 minutes). While the hazelnuts are toasting, melt the milk and dark chocolate together in the microwave in short bursts stirring until smooth. Remove the hazelnuts from the oven, place in a blender and blitz until a paste forms. Add icing sugar, oil and cream continue to blend until the mixture is as smooth as you would like (I like mine with a little texture). Add the melted chocolate and blend again until well combined. Transfer to a glass jar and let it cool with the lid off to room temperature. Once cooled pop the lid on and try not to eat it all in a few days. N.B. This is the texture for a Gianduja spread, but if you would like a perfectly smooth spread like Nutella, you can strain the mixture to remove any hazelnut chunks from the spread before you cool the mixture down. The mixture will thicken as it cools, but like dulce de leche, you can heat it up a little in the microwave to make it easier to spread. Congratulations on the make over and move! Looks slick! And I think Nutella is a brilliant way to celebrate! Chocolate always wins ;D the site looks great, congrats on a smooth transition! excellent way to kick off the new look for chewtown. so professional looking! The new site is beautiful!!! You were an absolute dream client and we’re so happy with how the site turned out. Although I must say – looking at all those gorgeous food images had me constantly hungry throughout the job! Adore the new site amanda. It still stays true to what your logo and branding was but it had a make over. LOVE IT! this sounds amazing! i cant wait to make this next week! Recent Post: Flourless chocolate hazelnut cake (gluten-free) and a weekend away in Crookwell NSW. Great looking new site! Really nice design. And great looking dish, too. Anything with hazelnuts and chocolate is a winner in my book. Great way to celebrate the new digs – congrats. What a better way to celebrate a smooth transition with Gianduja!